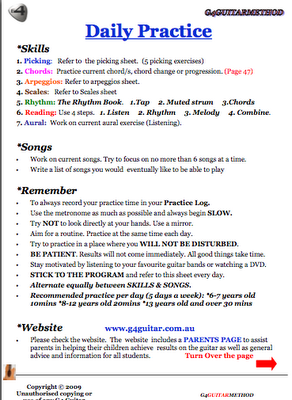 Guitar Blog: Improving your guitar skills. Start with what you are good at. Improving your guitar skills. Start with what you are good at. When I ask people the question 'What are you good at?' the answer is almost always related to a hobby (E.g. painting tennis, golf or writing poems or repairing cars etc.) Rarely do they mention the little things like cleaning their teeth, driving a car, getting dressed, taking a shower, speaking, writing or using a computer. We often over look these daily tasks because we are so good at them that no effort is required. In fact very little conscious thought is needed to execute them. So why are we so good at these things? There was a time long ago when you had to learn these skills. Each day you would struggle but gradually you mastered them. It was the daily attention you gave these tasks that resulted in your current level of mastery. That's right Daily Practice. Almost anything you do on a daily basis will become natural and second nature over time. In contrast if you were to do something only occasionally it will likely always take concentration and effort. It is enough to reach a certain level but if you want to improve beyond that point we need to be continuously challenged. Without this continuous challenge improvement is unlikely. We see this with language. Most people reach a point where their vocabulary for instance begins to plateau out. Without a conscious effort to increase your vocabulary through reading along with a dictionary and perhaps a thesaurus you are unlikely to improve much beyond your current level despite the fact that you use language everyday. The daily practice helps you to maintain your level but improvement comes through stretching yourself. Begin with daily practice and once you have locked yourself into a routine focus on making every minute of your practice count. Make sure you are being challenged and pushing yourself to the next level. Teacher or no teacher - What's the difference?